You may have seen the Quaker Harvest Crunch commercials. The ones with the middle-aged dad using reverse psychology so his son and father won’t eat his Harvest Crunch. He tells them it’s “bad” for them with its fruit and nuts and doesn’t taste good. As the audience, of course, we’re led to believe exactly the opposite. That it’s both tasty and healthy. But Harvest Crunch is just one cereal in my cupboard that isn’t as healthy as it’s marketed to be. The Heart and Stroke Foundation says cereal should have no more than 6 grams of fat per serving to really be good for you and no more than 240 milligrams of sodium per serving. An article in Alive, a Canadian health magazine, says you should also check the ingredients lists of cereals before buying. The ingredient listed first is the one that makes up most of the cereal. If sugar is number one, it means you’re getting mostly sugar. Though it says it “makes a nutritious snack” on the box and has 0 trans fats, it has 9 grams of regular fat and 7 grams of saturated fat. It also has double the amount of sugar suggested by the Heart and Stroke Foundation with 12 grams. 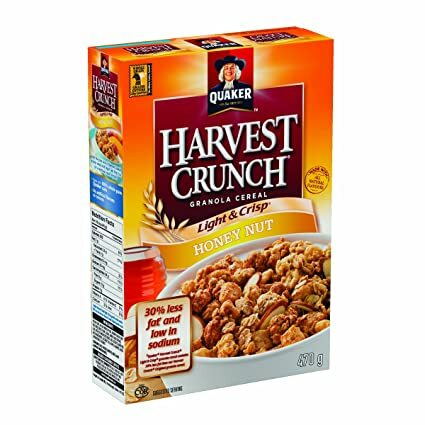 A look at the ingredients list shows Harvest Crunch is mostly rolled oats but brown sugar makes up the third largest percentage of the cereal. At least it doesn’t have much sodium with only 35 milligrams. Quaker did not fare well, overall. A bowl of its cinnamon-flavoured Life cereal, though just 130 calories without milk, has 9 grams of sugar. Whole grain oats are the number one ingredient but sugar is number two, meaning that Life is pretty much just a bowl of sugar and oats. Again, the sodium’s not bad at 170 milligrams and there’s not much of any kind of fat, but that’s still a lot of sugar. While the box boasts Just Right is low in all kinds of fat – 2 grams fat, 0.3 grams saturated, and 0 grams trans – it’s still over the 6-gram maximum of sugar with 7 grams. It also just meets the sodium requirements at 240 milligrams per serving. But, even though it has too much sugar, it does have some nutrient value. The main ingredient is whole wheat and sugar is just number five on the list. Despite all that sugar, at least I can take some comfort in knowing my brands of choice, MultiGrain Cheerios, and Corn Flakes have passed the sugar and sodium test. A bowl of MultiGrain Cheerios is just 120 calories, has little fat and just meets the Heart and Stroke suggestions with 6 grams of sugar. It’s a little high in salt but is still under the maximum at 200 milligrams. Sugar is high on the ingredients list in the number three spot but this cereal is mostly whole grain corn. Not only does it have the biggest serving size, but Corn Flakes are also the healthiest choice in my cupboard. They’re only 110 calories and have 0 grams of any kind of fat, unless you add milk and only 2 grams of sugar. Sugar is second on the list of major ingredients though, after flaked milled corn, which makes me wonder a little about the vitamin content. It’s also high in salt, but still under the 240-milligram maximum with 220 milligrams of sodium in each bowl. While it’s a bit depressing that over half my ‘healthy’ cereal is full of sugar, at least I know which ones to avoid now. And, though I’m often still hungry after some Corn Flakes, seeing how much healthier they are, I guess it’s goodbye cruel Life, hello Corn Flakes.